It takes special parents to raise special children. 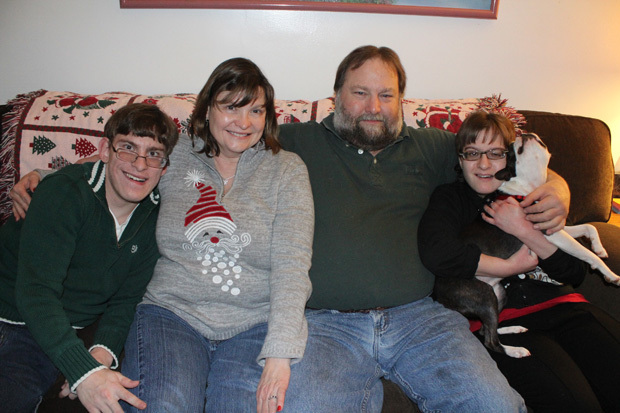 When the roll is called in heaven someday, Tom and Lorraine Schueller of Warrington will be present and accounted for, considering the loving care they’ve given their special-needs twins, Deirdre and Jake. Married 30 years this month, in 1996 they were looking forward to the birth of their children, when Lorraine, feeling sick, was hospitalized. She was diagnosed with HELLP Syndrome (hemolysis, elevated liver enzymes, low platelets), a condition that can be fatal to the mother but more frequently to the baby. When bed rest didn’t help and Lorraine’s condition worsened, the decision was made to deliver the babies three months premature. Lorraine came through fine but it was touch and go with the little ones. Deirdre was immediately rushed from their community hospital to Jefferson Medical Center in Philadelphia and given little chance to live. Live she did, although her first five months were on a respirator. She received a brain shunt, had eye surgery and at 10 months bowel surgery. Jake also had problems. When he was eight days old he too was transferred to Jefferson after suffering a seizure and placed on a respirator for three months. The twins clearly had challenges. When they were 2 years old, Jake was not yet walking at all and corrective leg surgery was recommended. The surgery was scheduled at E. I. DuPont Hospital in Wilmington, and the unthinkable happened. Through a surgical error the femoral artery in Jake’s right leg was severed. Despite many prayers, once more his life was very much in danger. Although he didn’t die, ultimately his leg had to be amputated. For Lorraine, that was her lowest point, the only time she was angry with God. Ultimately Jake was fitted with an artificial leg, and while Du Pont continues to cover the expenses, it has to be replaced approximately every two years. Caring for the twins was really too much for Lorraine alone, so Tom, who is in software development and project management, with the consent of an understanding employer began working from home, which he does to this day. Jake’s physical disability is most obvious but both twins also have mental challenges, Deirdre more so than her brother. Fortunately their school district has excellent services for children with special needs. In class, Deirdre would very often be disruptive, and “if Deirdre was having a day, Jake would have a hard time dealing with it,” Tom explained. When they reached high school, Deirdre with full-time learning support and Jake with part-time learning support, counselors suggested they should not go to the same school. “I go to Central Bucks South and Deirdre goes to Central Bucks West,” Jake explained. Actually both have completed their senior year, but because they are in special education they can continue in school until they are 21. When Deirdre is really upset, she just thinks about Taylor Swift, her favorite recording artist and her cat, and that helps. She also sings and plays the guitar, while Jake is especially proud of poetry he wrote that was published in his school magazine. At one point when another class was studying about disabilities, Jake cheerfully volunteered to go into it to demonstrate his prosthetic leg. He tries to look at the bright side: “I can never be drafted,” he said. His physical problems persisted even after the loss of his leg. Because his other leg was turned, it was only after very painful surgery that it was recently corrected, which makes it much easier for him to walk. 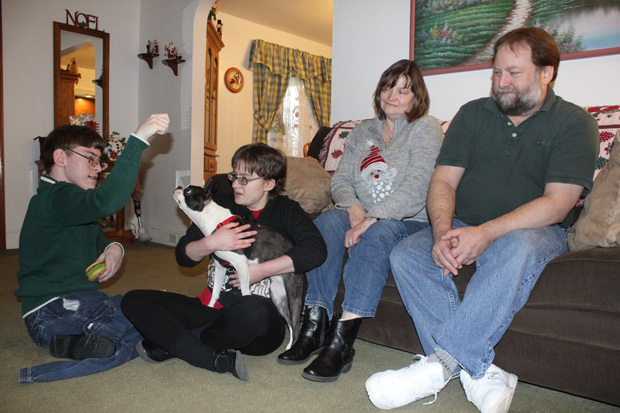 Whenever the family goes out it can be a challenge, because of Jake’s limited mobility, so they scout restaurants first for the simple things — is a rest room on the same floor? Tom and Lorraine do worry about the future. Their house has a full bath on the second floor and a powder room on the first, and Jake has grown. Tom will not always be able to help him up stairs. At this time, they are thinking about adding an addition to the house so Jake can have a ground-floor bedroom and his own bath. Whatever the future brings, Jake and Deirdre know they are unconditionally loved by their parents. As for the children, she and Tom believe “they are a blessing,” she said.